This blog as of 1 January, 2010 will be closed and no more posts’ will be posted on here. The reason behind this was due to my move from Florida to Kentucky. I will be continuing the blogging of my gardens at Nelson Park Gardens. I plan to keep this blog up for the time being, but in the future that may change. I would like to thank everyone who has visted and contributed to this blog in it’s short life span. I hope that you will continue to do the same thing on my new blog, Nelson Park Gardens. New posts’ will begin to be posted on the new blog, Nelson Park Gardens, the week of 4-8 January, 2010. A New Year Upon Us….. I know I ahven’t been on here and you all know why. I got here to Kentucky around the 15th and it has been cold and not a lot to post about. We have seen snow and that has been wonderful. Starting after the new year I will start blogging on the new blog. Don’t bookmark it because I think I am going to get another blog with a name I much perfer. Last autumn was not that great here in my part of Northeast Florida. It was dull and the leaves weren’t that showy and just seemed to fall off the trees. It really made me miss autumn like I knew they could be. This year has been a total 360. I believe it is because of the lack of any significant rainfall since May of this year combined with the very high temperatures that accompanied this summer and even early and mid autumn. The colors just within the past two weeks have really shown up and they are actually spectacular. The cooler temperatures and the angle of the sun must have pushed them to change. Unfortunately, I have no pictures of any of this great autumn color; I just thought I would share my observations. 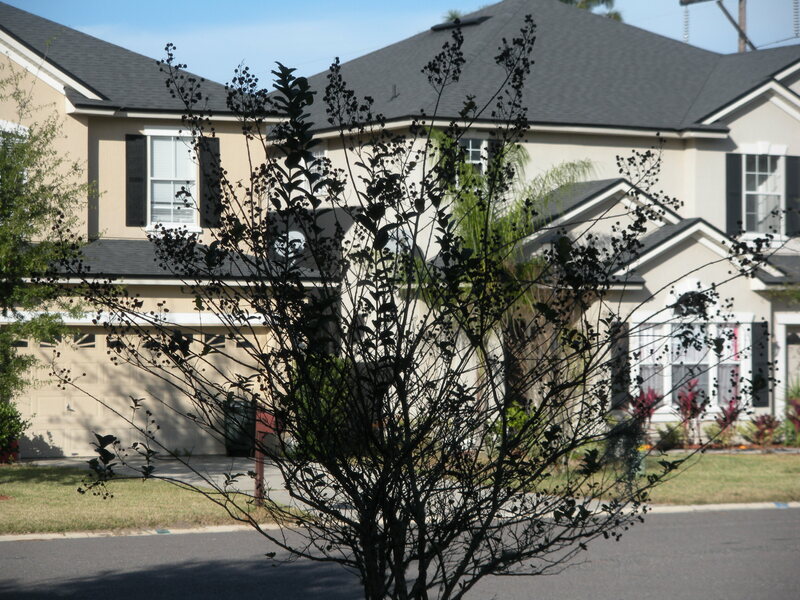 A tree that is very disappointing here in Florida for autumn color is the Crape Myrtle. These trees are so beautiful during the summer here like anywhere else but, the autumn color can’t be compared to their autumn color in states further up north. At my house this year after our summer 90 degree everyday marathon ended in October and with the lack of rain the trees started to regrow leaves like it was spring. Most of the leaves from this past summer and spring had already fallen of just because of the trees not getting enough water. Now the new growth just recently seems confused and has started to color, although no very pretty. The Crapes are now looking like it’s winter, which is fitting since winter started December 1, well, meteorological winter. When the meteorological season start make a whole lot more sense to me and that is what I go by. Okay, so before I get to the news I thought I would show off some more pictures of the house here in Florida. I promise I am going to try and do a post everday or every other day on this blog until next Tuesday. Next Wednesday is when the truck starts getting packed and I don’t think I will have enough energy to post; you know how moving is. Now to the news, I have started a new blog for Kentucky right here. Now, the post that no their will be the only post on the new blog until I tell you on here that I am no longer posting here. Currently there are pictures of the outside of the new house, my head is already churning out ideas, yay. Truly, nothing will probably get posted on my new blog until after the holidays in January because I won’t have time to put up all of your gys links on the new blog and I don’t want you guys to have to change my link during this busy time of the year. Keep Checking Back this week, I am trying to close my last week in Florida with a marathon of post.